1. When checking your admission status. You Must Apply for Change of Course/Institution before Printing Your Admission Letter. 2. When printing out your admission letter. Your course on admission is not the same as your first choice. Kindly apply for change of course/institution before you can print your admission letter. 1. 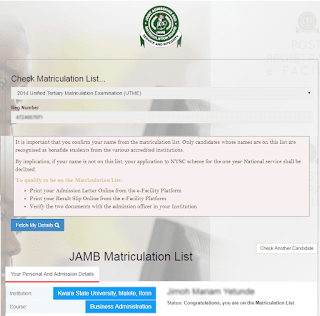 If the course you are been admitted to, is not the same with the one you filled in during jamb registration or change of course/ institution exercise. If you fall into any of the two categories stated above, you are requested /expected to regularize it. Make payment using your atm card, or to make payment at the bank select pay at the bank. How many times can I use the pin/unit to make changes? How many times can I used it to make changes to given registration number? Once I have made changes to twice to a given registration number, and I still want to buy a new pin/unit to make more changes, is it possible? The purchase pin/unit, can it be used to make changes to both course and institution? I have used one out of the chance left to make changes to a given registration number, can I be able to used the remain chance left to make changes to another registration number? Can I pay with my verve card. Please I av been trying to do change of course but response. I av paid for d change of course and d admission letter 2016. Still unable to do. Please what can I do if situation is like this. Present I am in 3level (DE) Unilorin.